After a week-long Raya Holiday, hundreds of pet owners returned home to find that their cats in Petknode, a Malaysian Cat Boarding center which they had left at were abused, missing or dead. Petknode failed to drop off the cats at the owners’ residences at the appointed times since Saturday night. Repeating call to the cat boarding center went unanswered and the company's website is down. Petknode Twitter page went inactive since 31st July. Petknode did returned some of cats to their owners but the owners were shocked to find their pets malnourished and sickly. Angry messages sped over Twitter and Facebook alerting other owners and animal lovers who rushed to Petknode yesterday morning. "Several pet owners received their cats from the company late Saturday night. 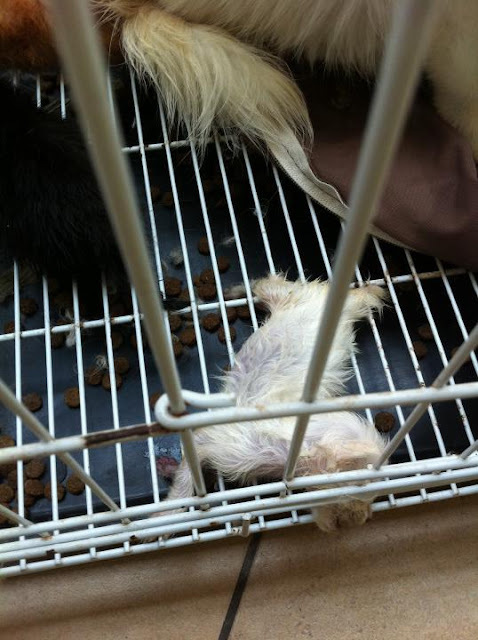 Left in a malnourished state, the owners complained on Twitter and Facebook. This alerted other pet owners, who eventually had to break into Petknode’s Damansara Damai office to get to their cats. It was later revealed that more cats were locked away in a Saujana Utama bungalow. The pet owners found over 300 cats without food and water for nine days. At least 13 have died from starvation. The police had since questioned two people over the incident. "S. 44 of the Animal Act 1953 states that for animal abuse and/or neglect, the maximum fine is RM 200 and/or 6 months jail." Shenaaz said that DVS officials are not animal-friendly and lax in taking action against animal abusers. She also criticised the Animal Act 1953 (2006 Amendment), arguing that it is not adequate to deal with animal abuse cases. Currently, the Act states that anyone guilty of cruelty to animals would be liable to a RM200 fine or a six-month jail term or both." "They took about 300 cats for boarding during 1 week Raya Holiday, with only 2 staff to take care of the cats. Some of the cat owner including me, pay for private nice rooms our cats, but we found out that there's actually no room, they left all the cats without food and drinks inside the cage and pet carrier, some of them inside a house. the cats also wet with pee n poo, about 15 of them found dead. u can see lots of picture in FB"
Update: Petknode Cat Boarding just did an apology to the public on Petknode FB profile. Do you accept their apology? "Dengan ini, kami, Shahrul dan Yushairi, pemilik perniagaan Petknode Online Pet Store, dengan hati yang tulus ikhlas dan rasa rendah diri, ingin menyampaikan rasa terkilan dan bersalah kerana gagal memberikan perkhidmatan yang terbaik seperti yang dijanjikan. Kami mengakui kesilapan kami dalam menguruskan pusat jagaan kucing kami sehingga kebajikan kucing-kucing pelanggan diabaikan. Kami amat menyesal disebabkan gagal mendapatkan tenaga pekerja untuk membantu kami menguruskan pusat jagaan kucing dan sebagai perniagaan yang kecil, kekangan modal dan sumber yang terhad menyebabkan kegagalan kami menyediakan tempat tinggal yang terurus untuk kucing-kucing pelanggan. Walaubagaimanapun, kami telah cuba yang termampu untuk menguruskan kucing-kucing pelanggan dengan segala sumber yang ada. Kami memohon maaf kerana menyebabkan kucing-kucing pelanggan menjadi tertekan, kurang makan dan minum, terabai kebajikannya disebabkan kekurangan dan kelemahan kami sendiri." Saya berpendapat bahawa jika perniagaan kamu (Petknode) kecil dan tidak mempunyai sumber , tempat tinggal yang cukup dan memuaskan, kenapa tidak bagi balik dan berhenti menerima kucing kesayangan orang lain? Jika telah terima maka kenalah jaga mereka baik baik... Setiap orang perlu tau kemampuan sendiri sebelum janji mau bagi service yang akan diberi. Kucing bukan manusia tapi tetap juga haiwan yang ada pemikiran sendiri. Telah dikurung dalam tempat yang kecil tak bagi makan dan minum juga... Insan macam kita juga tak boleh tahan puasa terus 1 minggu kan? Really sorry to hear this news especially to the owners. 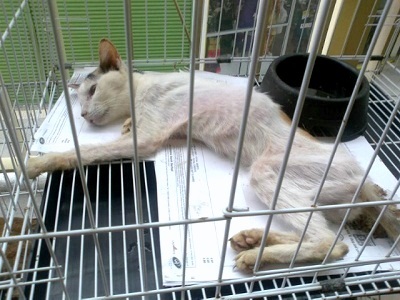 Hope the surviving cat getting healthier and better now with the volunteers help. The law MUST BE MADE STRICTER to make sure incident like Petknode severe animal abuse case will not happen again. Even a Facebook page call "100,000 people for Petknode's punishment" was set up to have enough support to petition the government for tougher measures against animal abuse. If you like animal too, press the "Like" button and share with your friend kay? Linkin Park Awesome @ Singapore F1 Grand Prix!! New Proton Saga FLX for Youth Like Us!! Hi Singapore F1 + Mysterious Blogger! HTC ChaCha - FB Share Link Easily. It shine! RM5,000 Shop for FREE with TALK-A-THON!! HTC ChaCha Make TC's Live FB Sharing Easier! My Selangor Story 2011 - Here I Come! Quick Photo Sharing through HTC ChaCha! Nigel Barker Official Facebook Fan Page Live Now!